Anyone test their sleeping heart rate? 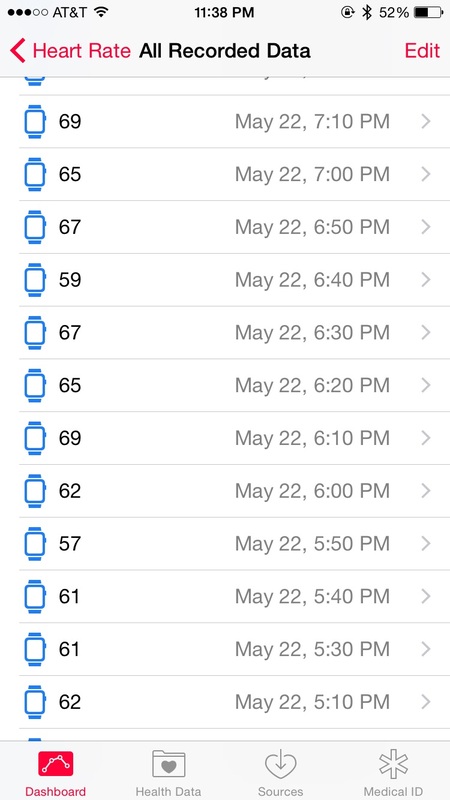 Discussion in 'Apple Watch' started by betabeta, May 22, 2015.
while sleeping my low was 45, funny thing is it hit that 3 times a night in a pattern and every night the low was 45 never lower. I assume during deep sleep, most of the time it was in the 50's. But I have had a reading a few times of over 100 I assume a dream? I think I'm going to fully charge it and set it for excercise for like 3 hours to get a constant heart rate. where it to sleep every night. WAs working great until 1.0.1. Although interestingly, it still takes every 10 mins when I'm sleeping but not during day. Yeah it seems if your not moving it will take it every 10 minutes. Not seeing that based on the screen shot you posted. Looks pretty inconsistent to me with some gaps of more than an hour. Woke up last night pouring with sweat from a fever, eventually had a shower and put some clothes on and grabbed a coffee.. then I decided I really did need the sleep and I had my watch on. Slept about 5 hours on the couch averaging 39bpm throughout (my normal resting pulse is pretty low though). My sleeping HR is 35 bpm. My resting HR is about 55. Then again I take a beta blocker for blood pressure so it keeps my heart rate comfortably low.